Stock photo of the Market and Tower at the Forks - a National Historic Site, City of Winnipeg, Manitoba, Canada. A sunny day at the Market and Tower at the Forks in the city of Winnipeg. 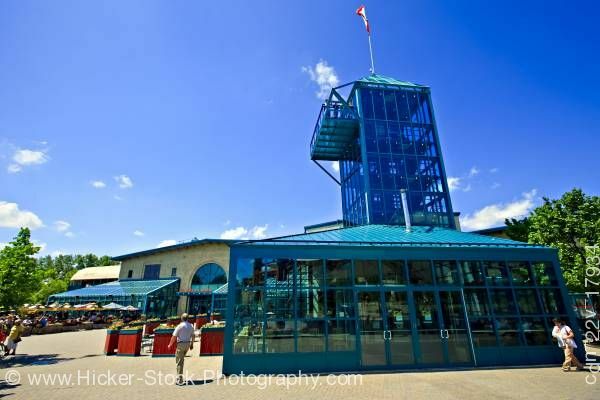 This stock photo shows a beautiful day at Market and Tower at the Forks - a National Historic Site, City of Winnipeg, Manitoba, Canada. A building made of glass panels and framed in metal painted blue. The building has a glass tower with a platform. The Canadian flag flies at the peak of the tower roof. A sunny day has visitors walking to the market. Wood planters painted red and green stand behind the glass building that lead to the front door of the store behind it..
Another building sit in the background of the glass building. The store front has a glass archway for the doors and glass paneled sections are attached to the building on each side of the door. In the distance, colorful umbrellas stand in front of a glass section off the building. Market and Tower at the Forks - a National Historic Site, City of Winnipeg, Manitoba, Canada.